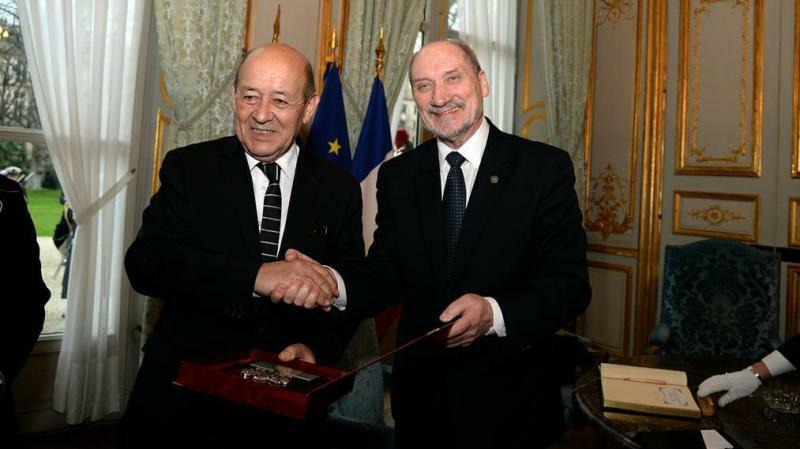 In Paris, French Defense Minister Jean-Yves Le Drian (left) made it clear to Antoni Macierewicz, his Polish counterpart, that France will not accept a reversal of Poland’s selection of the Airbus Caracal helicopter for a $3 billion program. PARIS --- The French government is stepping up pressure to dissuade the new Polish government from going through with the threatened cancellation of a $3 billion order for 50 Airbus Caracal helicopters. 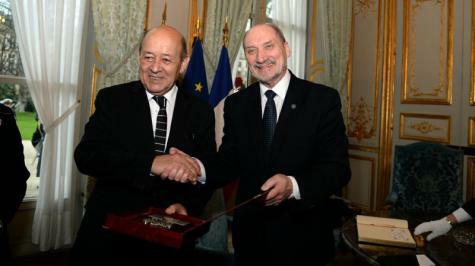 During a Feb 2 bilateral meeting in Paris, French Defense Minister Jean-Yves Le Drian reminded his new Polish counterpart Antoni Macierewicz that France had reinforced its military presence in Poland and had deployed fighters to protect Polish airspace. In parallel, it had offered to help Poland modernize its military by offering to sell helicopters, submarines and air-defense systems. “For France, the two forms of cooperation are inseparable, and talks will therefore continue,” the French defense ministry said in a Feb 4 statement. “The ministers broached these two subjects candidly,” the statement added in a diplomatic euphemism. “We agreed that on matters which concern the modernization of the Polish army we will continue the talks before the meeting of NATO defense ministers in Brussels,” Macierewicz said after meeting with Le Drian. Poland’s Rzeczpospolita daily reported earlier this week that Poland has decided to scrap the Caracal order, and would only buy “"several" French helicopters. It also said Poland had opened negotiations with Sikorsky Aircraft to buy locally-assembled S-70i variants of the Black Hawk. However, in a Feb 5 post on its Twitter account (above), the Polish Ministry of Defense said that “We have started talks with the Americans on weapons purchases. We want to buy modern equipment,” which substantially differs from what Macierewicz’s statements. Airbus Helicopters CEO Guillaume Faury denied the Polish media reports, saying Feb 04 that "comments which have come up in media recently induce speculation and gossip, leading to erroneous conclusions regarding the Polish helicopter tenders," adding that "The only true information is that talks with the Economy Ministry continue and that we are ready to support our Polish partners." “It is difficult to accept that an RFP could be reversed for political reasons. That would mean that there is political problem between the countries involved,” another official told the Paris website La Tribune. “We had to put the Poles in front of their responsibilities, and the Minister did it,” the official told La Tribune, adding “France cannot be flouted like this." It is most unusual for a government to openly pressure another on a commercial matter, and the strong wording used on the French side is a measure of its dissatisfaction with Poland’s attempt to cancel an issue that Paris considers settled. The United States have also begun to pile on the pressure, albeit at a lower level for now. “Sikorsky helicopters are the best in the world, and I’m thrilled Poland has restarted negotiations with Lockheed Martin,” U.S. Senator Chris Murphy (D-Conn.) said in a Feb 4 statement. “I will follow these negotiations closely, and do everything I can to help Sikorsky in this process because a new contract for 70 helicopters would mean billions of dollars in business for Sikorsky,” he added. The timing of the flare-up with France comes as the Polish government, already facing European censure over its controversial constitutional reforms, prepares to host a NATO summit in Warsaw where it hopes to convince its allies to increase their military presence on its territory.